It’s a well-known fact in my family that I could eat sandwiches, soups, or salads every single day of my life and NEVER get sick of them. Salads in the summer and soup in the winter and then sandwiches year-round. I like ’em simple, flavorful, and fairly healthy. The husband, however, is pretty different. He’s someone that likes a heartier meal (it doesn’t have to have meat, but he does like that) and tends to want soup only once every couple of weeks. The good news about that is, if I make a soup for lunch it is all mine and the babe’s for the rest of the week! And so, of course, if the soup is just for us, I’ll add tons of onions and be in onion PARADISE. Because the one and only food my husband does not do is onions and they happen to be one of my favorite additions to a meal. If the onions are “expert-level” hidden he usually won’t notice, but chunks of them in a soup is definitely a no-go. Luckily the babe has inherited my taste-buds in the onion department so we enjoy tons of onions in the soup all week long during lunch. The ingredient list is especially short if you pick up one of those pre-chopped veggie packs (mirepoix) in the grocery store that has carrots, celery, and onion all chopped and ready to go. Then your prep is really insanely quick. I’m talking like 5 minutes quick. Not that it takes too long to cut up the veggies since you only need a cup of each. 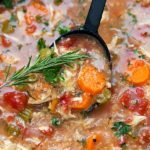 Increase or decrease any of those herbs to your personal preference — I like a lot of fresh parsley and rosemary, but add whatever you like best in an Italian-tasting soup. 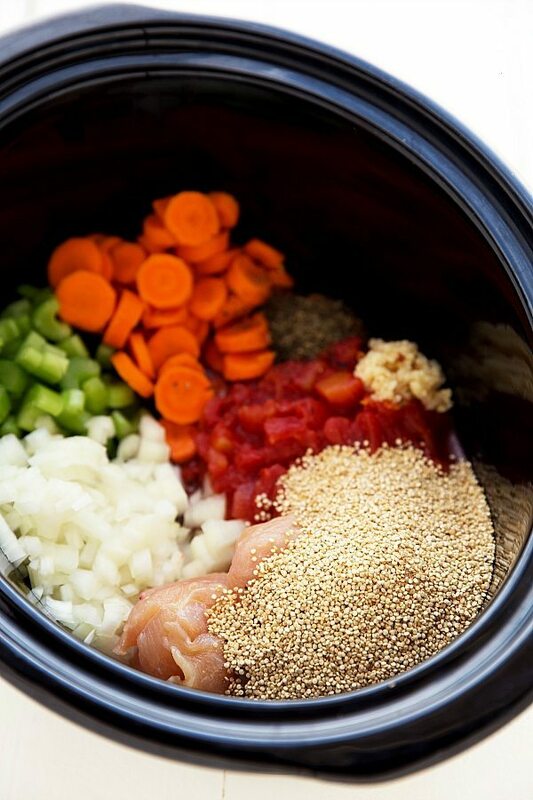 Each crockpot is a little different so the key things to look for is the chicken is fully cooked and shreds easily, the quinoa has “popped,” and the veggies are tender. 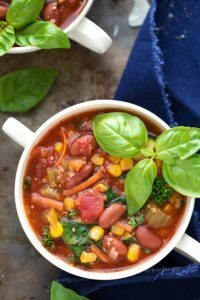 And by that point you are ready for one heck of a delicious and healthy soup! Add in the boneless skinless chicken breasts (no need to cook first), chopped yellow onion, chopped celery, diced carrots, garlic, uncooked quinoa (rinse to remove bitter saponin if your quinoa isn't pre-rinsed), and un-drained fire-roasted diced tomatoes. Add in the broth along with all the seasonings -- red pepper flakes, Italian seasoning, dried oregano, and dried basil. Make sure to add these seasonings to your personal preference -- if you aren't sure you want as much of something leave it out until the end where you can slowly add it and taste test it. If you want to add more - go for it! I always do the red pepper flakes, 1 full teaspoon Italian seasoning (and sometimes more), the oregano, 1/2 tablespoon basil, 1 one small sprig of fresh rosemary, and LOTS of cracked pepper. NOTE: the longer this soup "sits" or cooks the more broth that gets absorbed into the quinoa. This makes it heartier and also less brothy. If you want a more brothy soup, watch carefully and remove from the heat of the slow cooker when it is your desired consistency. Alternatively add more broth as desired. *For the chicken broth, I use chicken boullion cubes/powder dissolved in hot water. I could eat soup every day and never get tired of it, either! This crock pot version sounds just perfect, Chelsea! I love the quinoa in here. Sounds so warm and comforting! We could also eat those things every single day! Totally simple, but SOSO satisfying! Just like this soup. 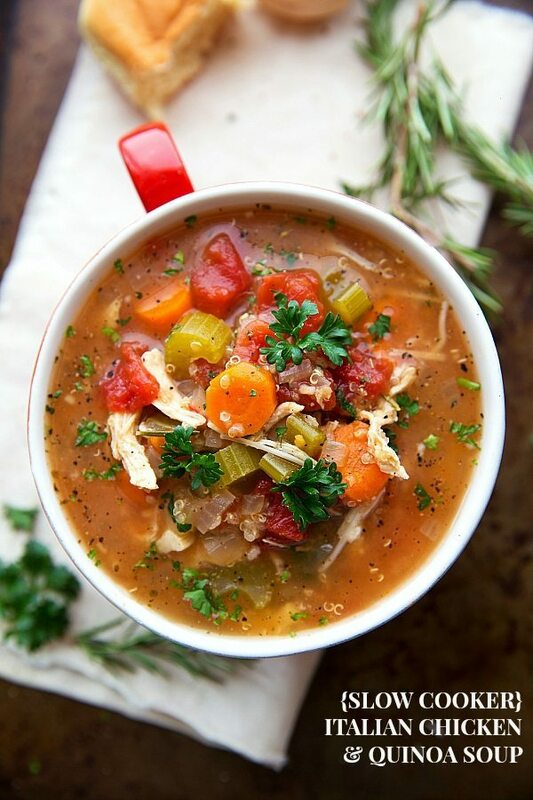 I am SO pumped for soup season…but more specifically THIS soup season! Pinned! I’m in love with soups this week. I’ve made 3 in the past week. They’re so comforting and whole family enjoys them. Definitely got to give this one a whirl! Thank you for the inspiration. I Have this going right now. Where’s the spinach? Could this be cooked all day on low? Or do you think the veggies would get overcooked? The veggies would probably be okay it’s just the quinoa that tends to absorb more and more liquid the longer it is in the crockpot. If you are okay with a heartier soup (less broth) then you should be okay to cook it on low for 6-8 hours. The quinoa really expands and absorbs more liquid the longer it cooks. I am wondering if I could use chicken thighs instead? I am wanting to make this at lunch! Looks great. My boyfriend doesn’t like quinoa on its own, but when I sneak it into soups like this he doesn’t notice and I love it. But, also wondering if I can use chicken thighs instead? Me again, haha! I was also wondering, can I add more veggies? I was thinking yellow and red peppers and corn? Corn I know to add at the end to just heat through, but im wondering about the peppers? could I throw them in at the beginning with everything else? Hey Katherine! I actually haven’t tried chicken thighs in this recipe and to be honest I’ve never cooked chicken thighs in the crockpot so I really can’t say. As far as veggies, absolutely you can add some more! The corn you could add in right away (drained) or at the end. And then peppers should be delicious too. You may want to sauté them in a little olive oil before adding them to the crockpot or they might still have a “crunch” after everything else is cooked. If you don’t mind that then just throw them in raw too 🙂 Hope that helps! What do you think is conserider a serving size? 1 1/2 cups? 2 cups? 1 serving size would be the entire soup divided into 6 or 8 equal parts 🙂 I’m not sure the exact cup amount, but if you are figuring it out for nutrition facts, the best way would be to equally divide the total soup amount. This was delicious and hardy. I used chicken thighs and upped the quantities slightly because my package of chicken was a little over a pound. I also substituted zucchini for the celery since that was what I had in the fridge. I made it on the stove top on a cold day and added some kale at the end (trying to use up the last of what I had). The quinoa really does soak up the liquid and gives some great body to the soup if you don’t like things to “brothy”. Used all the recommended herbs too. Family loved it! Awesome!!! So glad to hear it 🙂 And isn’t it the best when you are able to use what you have in the fridge leftover? Thanks for the comment! Can you recommend something in place of quinoa? I can’t eat quinoa. What are the calories and serving size? Going to be making this today. How many cubes of boullion do you use? I’m planning to make this for my lunch at work. Sounds delicious. Do you think this could be turned into a freezer meal to give some prepped meals to a friend? I think it would be a great freezer meal! Perhaps just keep the quinoa in a separate bag? Enjoy! Making this now! Smells lovely. Wondering how do I store it? Looks yummy but I don’t have a slow cooker…any recommendations on how to adapt this to stove top? I just pinned this recipe. I’m wondering if I could leave this on low all day and add the quinoa lets say about 2 hours before turning it off?? We loved this! I added a little chopped kale too. Thanks for the recipe! 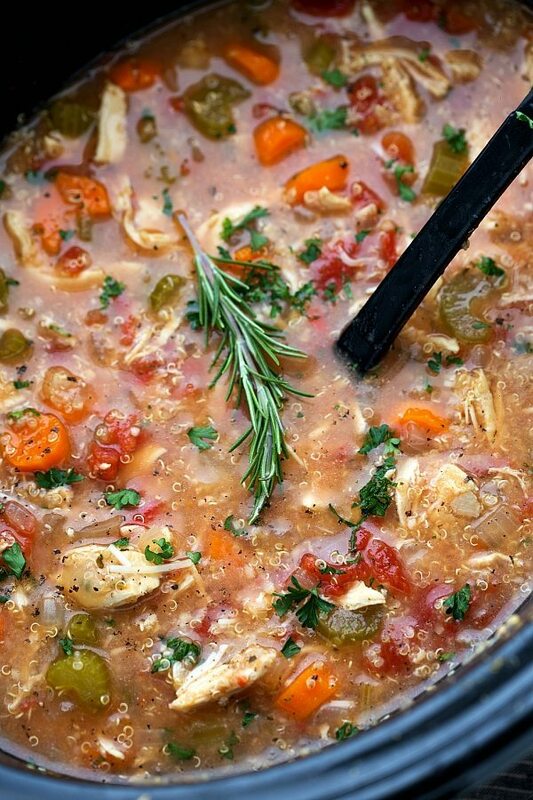 This soup is fantastic!, no really- it’s amazingly easy and so warm and comforting. You literally dump all the ingredients into the crock pot and for us, 4 hours later it was done. We left the house, and when we opened the door it smelled like thanksgiving. We plunged into the soup and it was so satisfying and delicious. After dinner i sent this recipe to my daughter who is extremely busy with her career and my son who is senior in college studying to be a dietitian. After all my raving about easy and delicious they are both trying the recipe this weekend. Thanks so much! Thank you so much for this sweet comment Sharlene! I’m so thrilled to hear it’s been a hit and you’ve passed along the recipe! Thank you for the review! This was my first time trying one of your recipes and after making this soup….I’m a Fan of yours!!! This soup was delicious!!! Both my husband and I loved it!! So yummy!!! Thanks for the great recipe! I look forward to making many more that you suggest!! Oh I am so happy this was such a huge hit Shea! 🙂 Thank you so much for the comment! Since I have an instant pot now, I used the sauté function to cook the onions, celery, carrots and garlic for a bit before adding the rest of the ingredients and switching it over to the slow cook function. But even with that slight change, this soup was seriously amazing! 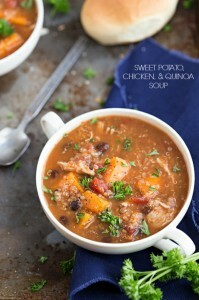 Perfect for a chilly fall night, and healthy too. Thank you for the recipe, we will definitely be making it again! 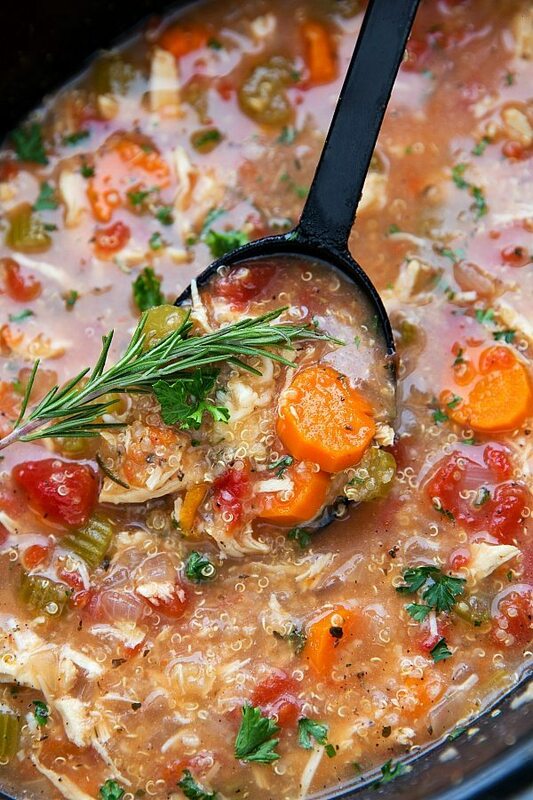 I’m a sucker for Italian chicken soup. My husband likes a heartier soup, so I’m cooking it for longer! If you want to make it even healthier, there’s a product called “Better Than Bouillon.” It’s a soup base, used a lot like bouillon (but tastes better in my opinion) and even has an organic option. 1 tsp = one bouillon cube. Thank you so much Grace! I’m so happy you’ve been enjoying some of my recipes 🙂 I hope you love the stew! I’ve made this and it’s fantastic! question though: can I make it with frozen chicken breasts? I figured it would make the broth a little thinner but with the quinoa absorbing it I figured it could be okay? What do you think? Thanks so much Kayla! I’ve never tried frozen chicken with this, but I would recommend thawing it first because I think the quinoa would be too mushy by the time the chicken cooked. Hi Chelsea! Thank you for posting this recipe, the flavor is quite delicious. I am not really a crock pot professional, so maybe you can help me out? I followed your recipe exactly, but I noticed that my chopped carrots and celery are still hard and crunchy after 5 hours of cooking in the crock pot. How long does it normally take for these vegetables to soften? Thank you again for a delicious recipe, I hope I can get it down perfectly next time! Thanks so much for the comment Rhi! I’m glad you enjoyed the flavor, and I’d love to help troubleshoot the veggie tenderness. At 5 hours of cooking was the quinoa and chicken cooked through? 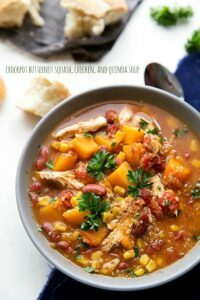 You might have a cooler running crockpot so it’s possible this dish could take longer in your crockpot. And then how thinly did you slice the carrots and celery? If you try it again, I’d try to make sure they are both very thinly sliced. And lastly, make sure you don’t open the crockpot during the cooking if you can avoid it. It takes a long time for a crockpot to heat up again after being opened 🙂 Hope these tips help! Would the cooking time be the same without the chicken? It will be a similar cooking time without the chicken for the quinoa to fully cook and the veggies to get soft. It’s in the crock pot and can’t wait to try it! I put kale and some northern beans in with it plus lots of onions! Made this for dinner tonight; other than using plain quinoa (couldn’t find any flavored), followed the recipe exactly. It was delicious! I cooked this and ate some before I went to bed. Delicious. Turned off crock pot to let cool before refrigerated and quinoa soak up almost all the broth and a lot of the spices flavor. Just wondering if there is a way to add liquid to present soup and some extra spice. Thanks.